Welcome to the first CLEAR community newsletter and the start of our new blog! We look forward to sharing ideas and achievements as this new initiative develops. Most of our work so far has centered round engaging people and establishing a network of ideas so that we can progress in unison, to serve the imaginations and aspirations of our community in Java and worldwide. 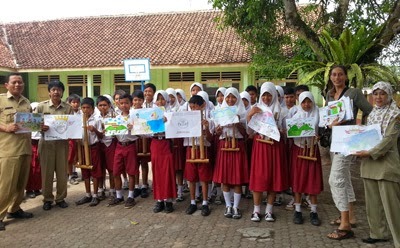 Our first design competition has been a great success, with around 300 entries from children and adults in the Batukaras area. Ideas were invited in the form of drawings, logos and slogans, with the themes ‘Environment’ and ‘Creativity’. Inspiration from entries will be developed into signs, posters and T-shirts as part of helping increase awareness of environmental issues. For school age winners prizes include art materials and a donation towards their personal school-managed education fund! View a selection of our competition entries here. Art and craft sessions have been taking place with children from around the village. 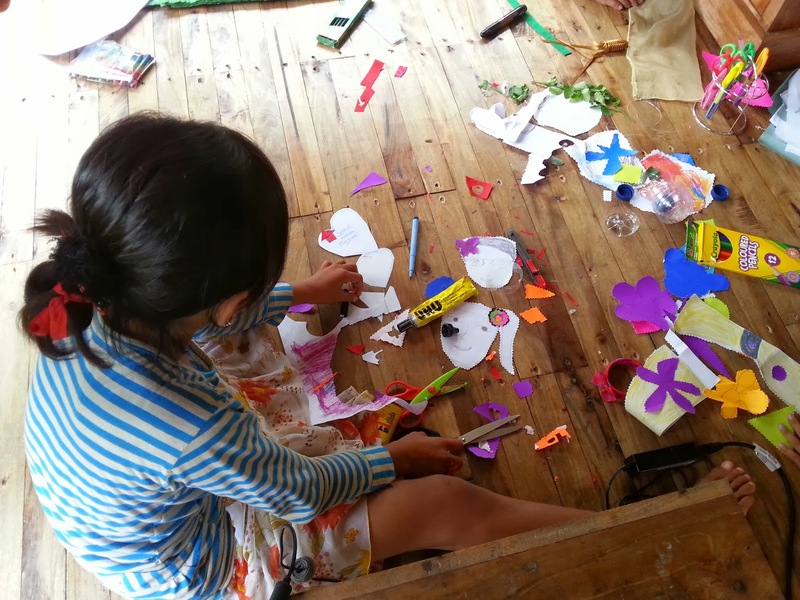 Most of the local village children do not have access to art materials at home, and many local people want afternoon learning activities for children, so offering a supported environment for creative play has been something the kids have cherished and found really exciting! 😀 ….and we have found it incredibly rewarding and enjoyable too! CLEAR organised workshops sessions employing a local craftswoman to teach others in the community how to weave funky bags out of waste coffee packets. 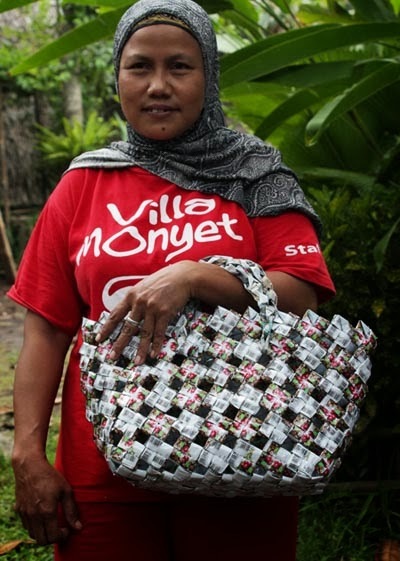 These bags not only look stylish, but they also link-up creating local employment and avoiding waste pollution at the same time! As part of establishing ‘CLEAR Creations’ craft co-operative, these great bags will be soon be on sale in outlets in the UK. CLEAR were invited to speak at a local school by Bill Jones, a local teacher who is passionate about environmental issues. Bill has spent several years working with the teachers and staff towards increasing awareness of littering and environment issues so that now the habits of the students have changed and the school grounds are clean and litter free. 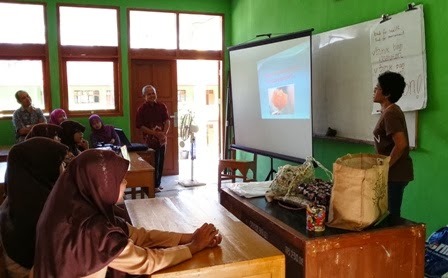 Intan Sinuhaji and Chani Leahong from CLEAR attended the school to give a workshop about the environmental impact of waste pollution and ways to adopt good approaches for the future. CLEAR proposes to offer more education visits to other schools in the area, as part of their education program activities. We have started a new CLEAR Community facebook page as an information portal for everyone involved in CLEAR worldwide to share inspiring and relevant news and ideas. 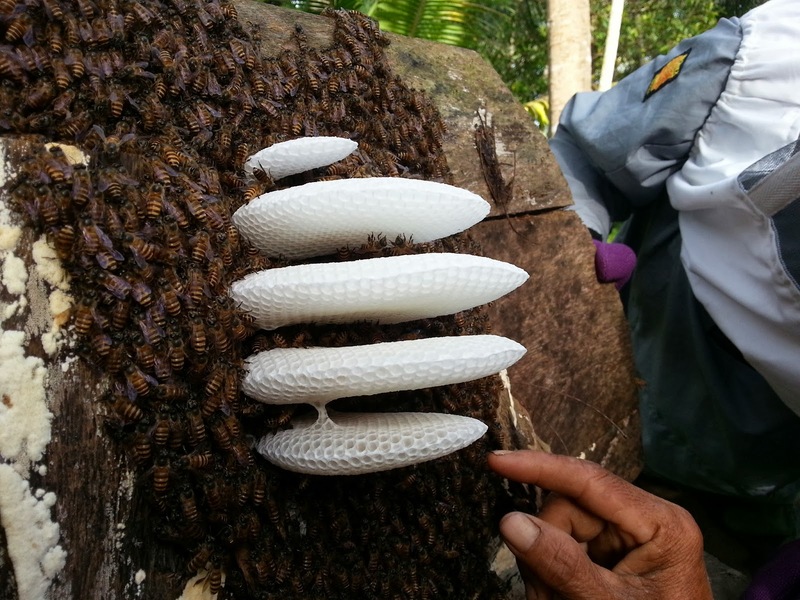 For communities in Java, Indonesia, there is not as much access to environmental or arts networks compared to many other countries; this, coupled with the media predominantly promoting consumerism and commercial interests, means there’s a very real need for offering an alternative message. Stunningly beautiful riverside land is being prepared ready to build an education facility and workspace from which CLEAR activities can operate in the future. The proposed facility will be built using traditional wood and palm thatch construction techniques. A well has been dug to provide a clean, consistent water supply. Also major works took place along the riverside banks, with a simple natural system of rock piles for bank erosion control, amoungst which some trees and plants will be planted to support a soft, natural riverbank ecosystem. 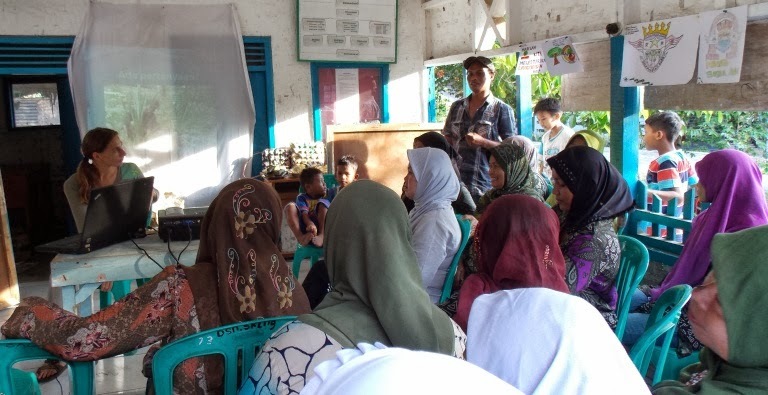 Community meetings were held in collaboration with village leaders this year at which we invited suggestions from villagers as to the things they would like to see facilitated as part of the CLEAR initiative. In addition we presented some key environmental concepts surrounding pollution and improved waste management opportunities. These meetings were building on comprehensive consultation work carried out the previous year in one-to-one meetings with a broad spectrum of local community members. 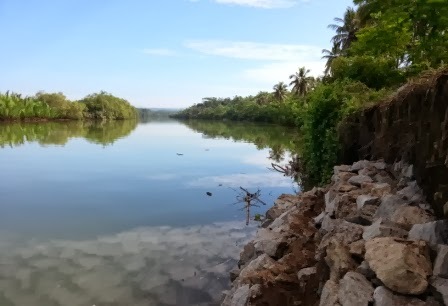 CLEAR worked with local community group, Karang Taruna Batukaras, as part of their ‘Back to Nature’ event, which included a nature walk, beach cleaning, and a big outdoor music gig in the evening. CLEAR community representatives have been getting involved to support tree planting initiatives in the local area. 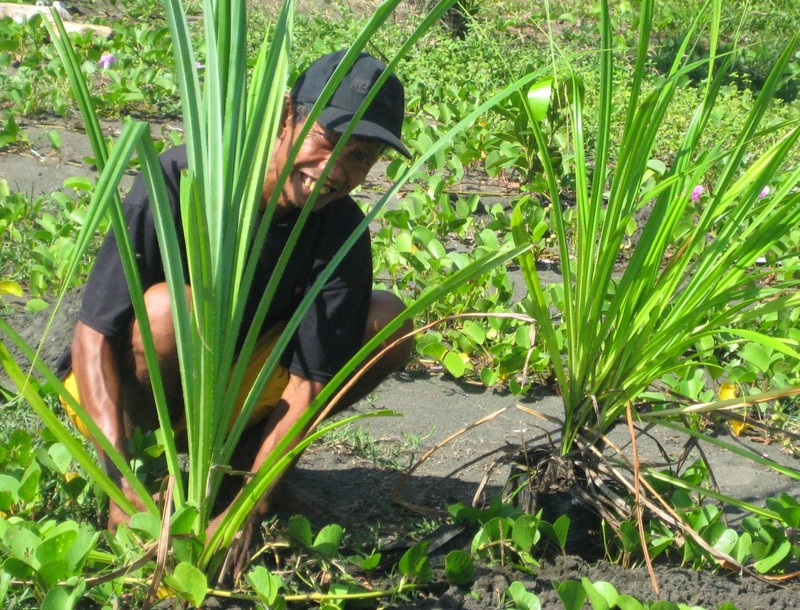 One of the initiatives is led by the community group Karang Taruna Sanghiangkalan and included beach cleaning and planting. Another event with local Scout Group involved a nature trek and planting mangrove seedlings. This is great Chani! 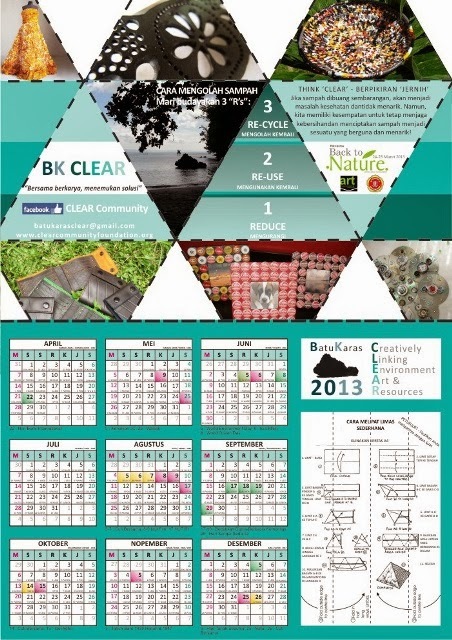 It was wonderful visiting Batu Karas last year and finding out everything that CLEAR is doing. I enjoyed taking part in some community planting as well as some meetings about the waste management project. A great vision and a good website and blog. Keep it going! Trevor.